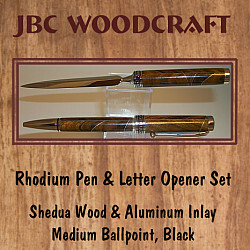 Make a statement with this one-of-kind desk set hand crafted by JBC Woodcraft®. Solid and heavy, this classy desk set was hand turned from exotic Shedua Wood and inlaid with fine aluminum banding throughout. Featuring sturdy "Artisan Design" Rhodium hardware and polished to a high sheen. Smooth "twist" pen function. Medium ballpoint, Black.